I want one like this ! This page covers my asymmetric project. I'll keep updating as it moves forward. Sailcut CAD and with a little manual reading and messing about, I've been able to generate a set of drawings for the panels for an asymmetric spinnaker. 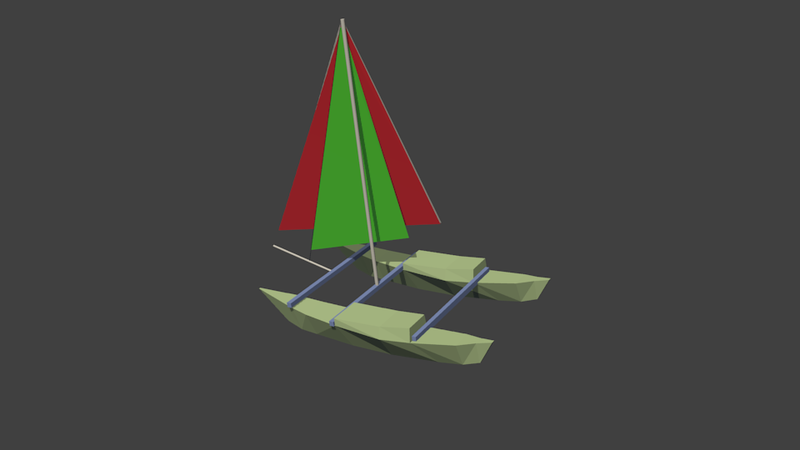 My first attempt, of course, was a test and I learnt that I would need a set of dimensions from the boat including details for the bowsprit and sheeting points, clew height etc. I could go down to the boat and try working this out, but it's not ideal or easy. Looking at some cat profiles, the length seems about 15 to 20% of boat length in front of the bows. So about 1 to 1.2 meters. I did at least set up a temporary sprit on the boat and gave it a test run and took off the dimensions. 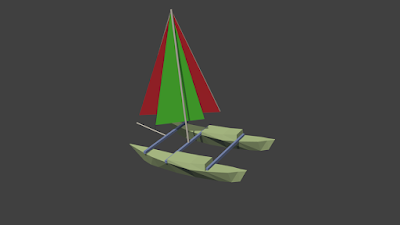 So I've decided to build a 3D CAD model of the boat so I can work out any dimensions and hopefully test the designs. This is the sail now generally referred to as the Code Zero. 70% of maximum area, and 40% larger than a Genoa. Excellent light air performance. The choice for light to moderate air close reaching. TWA of 70-130, AWA of 30-120 depending on girth and velocity. Critical for the newest swept-back-spreader rigs with non-overlapping jibs. The r2 is designed as a light to moderate air sail. It is typically used as soon as the spinnaker pole squared is back from the headstay. 10-22 knots is a normal true wind range. Full, powerful sections for running, modified slightly to allow for pole on the headstay angles in transition conditions. A full sized reaching asymmetrical, it is the best choice when adding an asymmetrical to an existing inventory, since it is as close to an all-purpose sail as possible. It is designed for the middle range of reaching angles in moderate breeze, but as a fullsized sail, it is capable of working effectively at broader angles. A full sized, maximum power running asymmetrical, for use with the pole well-squared. Optimised shaping and structure for moderate to heavy air running, typically used in 18-30+ knots of true wind. Full, powerful sections for running. To build a 3d model in CAD I've used Blender 3D. I've some experience with this package. It's very powerful and, although not design as a CAD, works accurately with physical dimensions. I'm not going to attempt to explain how to use this package, but here's the result. To achieve this I've used a set of photos of Tiki 21s taken from the side, and a set of measurements taken off the boat. The important dimensions are the rigging that will set the bowsprit height. 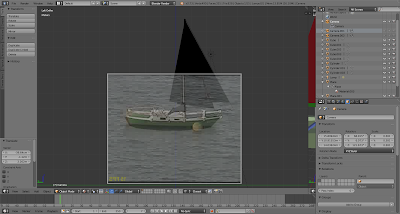 Blender allows you to place images into a 3D space. When the orthogonal elevations of the model are viewed, the images can be seen as overlays. This allows you to model over the images. The overall scale is set according the the boat's overall dimensions. With the 3D model built and lining up well with the real world, I will be able to input the dimensions to Sailcut. However, what sail do I want? There are, of course, different types of asymmetrics. Different sails for different wind angles and strengths. There are many interesting things to discover about these sails as explained in this guide. So what wind angles might I experience. Back to the computer and this time we'll use Kig to model apparent wind. What wind angle would be experience with a 10knt breeze, going downwind and 6.3knt at a true angle of 140° ? The answer is 100, a bit of a surprise. What angles do we expect to work at and what do we want? How to choose an asymmetric. So it seems the answer is either an A2 runner or/and perhaps an A3 reacher. Knowing this allows me to answer the Sailcut CAD questions regarding mid section width (girth). So I should now have the information to design the sail. What about making it? I need to know what material to use. Spinnakers often use light material quoted at 0.75oz. What does this mean? Guess what, it's not simple. A sail maker's yard is not a yard by a yard. Here's a conversion table for easy reference. See so now I need to work out what weight to use for an A2 or A3. Again a bit of searching and we find some information on codes and cloth weights. Ok simple, just buy some cloth? Sorry, it's not that simple. First we need coated nylon. Parachute cloth is porous to allow air to flow through for some complex aerodynamic reasons. Coated cloth is non-porous and waterproof. That's what we need. OK, so you try buying some! Searching eBay for some cheapish cloth and we soon find it's all 1.5oz or more. It seems 0.75oz does not exist. That's because the quoted weight relates to the pre-coated weight. This actually makes sense as this tells you about the probable strength. Spinnaker cloth weights are quoted this way to indicate their strength. Tri-radial construction takes advantage of warp-oriented styles because it ensures that the major sail loads are aligned with the most stretch-resistant axis (the warp) of the fabric. As most sailors know, the quoted weight of a spinnaker fabric is nearly always somewhat less than the actual weight (see illustration). Traditionally, it was the weight before the resination and heat shrinking. The actual finished weight of most so-called .75-ounce materials will come in at around 1.0 SM-oz; while the lightest 0.4-ounce. styles actually weight about 0.7 per SM-oz. The true finished weight of sailcloth is measured in grams/m2 or Sailmakers ounces/yard. More often sailmakers and sailors quote a generic weight such as 0.7Soz. Historically this is derived from the cloth weight before it goes through a finishing process. Nowadays it is used to describe a generic group of similar finished weight products and does not actually correspond to a specific cloth weight. In practice the variation from the lightest to the heaviest product in a generic weight group makes almost no difference to performance. If your class rules define a minimum weight your sailmaker will know the precise finished weight of all AIRX products. So I bought some PU coated nylon quoted at 35gsm (~0.5oz) for an A2. It arrived and weighed in at 50gsm. But that's ok as explained above. So I'm making progress, I have a design and material. But the devil's in the detail. There are lots of extra bits on the sail. It's not just a big sheet? We have clew, head and tack points and they need strengthening. Then there are leech tapes, cords etc. Looking around the internet and I can find a few specification of what might make sense. Tell tales take all the geuss work out of trimming asymmetrics. Where should the telltales be on asymmetrics? We put ours about 300- 400 mm from the luff at ¼, ½, and ¾ heightand this allows you to see the airflow over both sides of the sail. Tread Sizes are another mystery. Sailrite specify V-30 thread. I can get this in the UK (so far) and it seems V92 might be the next best thing. As to needles, I found a mention that 19/120 is the best size to use when sewing with V-92 thread. So from all this, we nearly have a full specification for the sail. Just need a way to put it all together. There are two main task. Cut the material, sew the panels together. This is tricky, as I don't have a CAM cutter in the garage. Also, I can't plot paper patterns full size. This is still a bit of a challenge, but I have a few approaches to try. Set up a large table with measuring tapes. 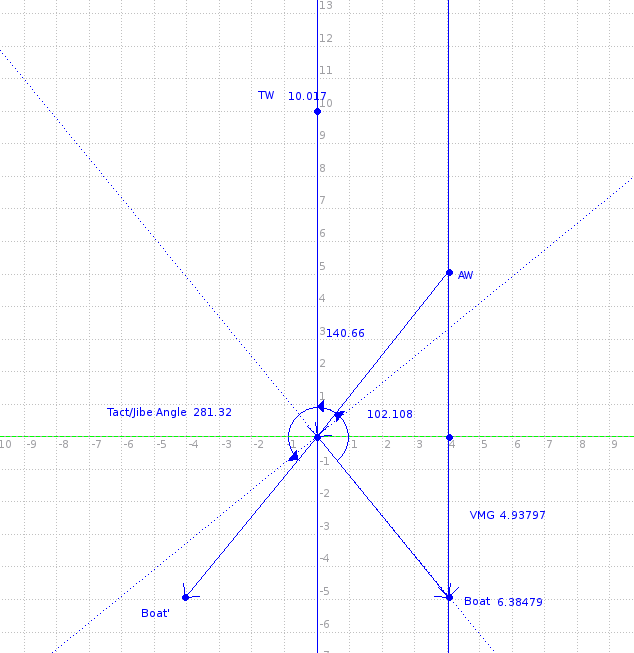 Use T-squares to mark out the vertices of each panel. Join the dots and cut out the panels. Print out a scale drawing. Mount one corner as the origin on the cloth. 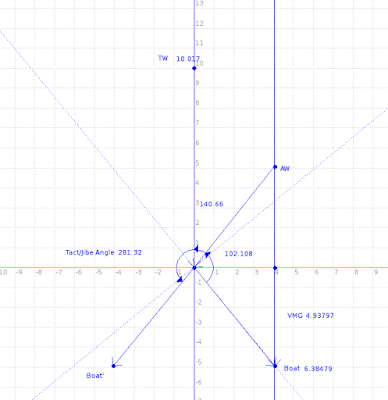 Project the other vertices using a ruler and a scale factor. Mark out cloth using a digital projector to project the image of the layout. Then cut. More details on the project are found in these posts.